When It comes to obtaining a Medicinal Marijuana Card recommendation from Thomas Sazani MD, the only thing standing here in your way is your belief of the fact that “will” the usage of Medicinal Marijuana bear fruit in providing relief to your ailments! Here at Thomas Sazani MD, the physicians make it their utmost duty to provide recommendation to qualified patients with as much ease as possible. Just like every other well renowned organization, every patient gets the chance to have a one on one conversation with a designation physician who will listen to any thing you might have to say and help you to figure out the root of your problem and find the most potent solution for it. 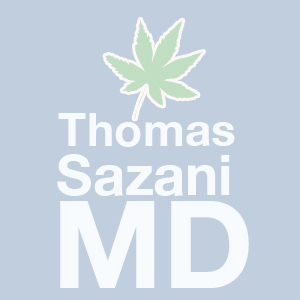 Aside from being extremely hospitable, Thomas Sazani understands that it is necessary to always protect the privacy of its patients and so, it is always guaranteed that the patient- doctor confidentiality is always followed, and no personal information is released without written affirmation from the patient themselves. The sympathetic doctors here are always on the verge to listen to your heart’s content and help you in any way possible. You will always feel at home as they will never react to your problems in a negative or demeaning manner. Here, you will be able to get qualified for a large number of diseases including headache, severe injuries, arthritis, PMS etc. Regardless of what disease you may have, it won’t be a hassle at all as you won’t have to bear a bucket load of documents with you to get your recommendation. The doctors here at Thomas Sazani MD’s will just evaluate you based on your current condition, take a history and you are done!